How Come So Many Bernie Bros Are Women and People of Color? A recent CNN poll shows that among potential Democratic candidates in Iowa caucuses Senator Bernie Sanders has the highest approval rating from people of color. And the diversity of the Sanders-inspired left was on display at the Sanders Institute Gathering in Burlington Vermont earlier this month, which I covered on my podcast, The Katie Halper Show. Even those who openly mock the concerns of the white working class, undermine their own alleged commitment to marginalized voices when they ignore the diversity of Sanders’ supporters. Sanders’ critics smear him as blinded by straight, white, male privilege. The mere mention of class gets Sanders and others condemned as class reductionists. The irony is that many of the most vocal critics attacking him for being insufficiently intersectional fail to address class altogether as an aspect of identity. It’s cruel, immoral and politically disastrous to dismiss the experience of working class people of all colors and backgrounds. But even those who openly mock the concerns of the white working class, undermine their own alleged commitment to marginalized voices when they ignore the diversity of Sanders’ supporters. By ignoring the people of all ages, backgrounds, genders, sexuality, and ethnicity who support Sanders, they engage in the very erasure and marginalization of the women, people of color, LGBTQ people (and all the intersections thereof) that they claim to oppose. The real story is very different, as I found at the Sanders Institute Gathering. Organized by Jane Sanders and David Driscoll, the 3-day event was more about the movement that Sanders helped spark than it was about the man. Though Sanders delivered the keynote and participated in several panels, the gathering focused on issues, bringing together leaders, thinkers, organizers and activists. Participants included physician and public health activist Abdul El-Sayed; San Juan Mayor Carmen Yulin Cruz; actor and activist Danny Glover; executive director of Good Jobs Nation, Joseph Geevarghese; Our Revolution director, Nina Turner; Presente.org’s executive director Matt Nelson; and many others. Over the weekend, the panels and roundtables addressed healthcare, climate change, criminal “injustice,” civil rights, immigration, Puerto Rico, the housing crisis, the international progressive movement, and other issues with attention to class, race, and gender. What we are fighting for is to bring people together—Black and White and Latino, Native American and Asian American—around an agenda that speaks to the needs of ordinary Americans and not just the one percent. We want Medicare for All, we want to raise the minimum wage to a living wage, we don’t want our kids to be living in a planet ravaged by climate change. So we are making progress. We expect opposition to continue. And we’re gonna do the best in this fight that we can. When you look at corporate media, you’re looking at media owned by large, often international corporate conglomerates, which are owned by some of the wealthiest people in this country or in the world. They will do anything and everything they can do to protect their own interest and they will say anything about anybody that they want. When people are pushed aside, when people are hurting, you have demagogues who step in and say “Our problem is that Mexican who is picking strawberries.” So you take that anger and frustration and pain that people are feeling and you turn them against people who are in worse shape than [they] are. And our job is to bring people together and say, “No. It is not some Mexican who is picking strawberries who is our enemy. It is Wall Street, it is the fossil fuel industries, it is the drug companies, it’s the insurance companies.” Let’s stand together and take those people on. Senator Sanders came and spoke in Stockton in a presidential campaign, which was unheard of—someone running for president to come to Stockton. And I was able to introduce him. And I was also impressed with the number of people who were at that rally in the middle of the day like five- or six-thousand people. And Stockton’s not a super rabid political town and I was like, “Wow, this message is resonating.” And I think that gave me the confidence to be a little more bold in my policy prescriptions or pilot programs that we’re doing in the city because I saw the hunger and the want for a government that is actually responsive and works for regular everyday people. Tubbs sees intersectionality and multiracial organizing as challenging but crucial. Right before speaking to the mayor of Stockton, I interviewed the former mayor of another California city. Eighty-three year old Eugene “Gus” Newport worked with Malcolm X, is the great grandson of a slave and was the mayor of Berkeley from 1979-1986. He and Sanders were mayors at the same time and Newport had stumped for Bernie earlier during Sanders’ unsuccessful runs for governor of Vermont in 1972 and 1976. Newport recalls that as the two campaigned in Burlington, a reporter asked Sanders, “Why does a Jew from Brooklyn, who’s a Socialist, invite Gus Newport, a former black nationalist and a socialist from Berkeley to campaign for him in a state that is 97% white?” Bernie’s answer was short: “Because we’re gonna talk about the issues.” After that, Newport explained, the reporters had no more questions. “I’ve loved him ever since,” he said. The media—look who they work for, that’s corporate America. You must remember Malcolm X was a socialist and Martin Luther kIng was moving towards socialism when he talked about the war against Vietnam. But a lot of Black leaders didn’t go along. We’ve got to educate our own to become an integral part of this. And we’re gonna do it. Danny Glover and I, we’ve gone down to Mississippi and South Carolina with Bernie. And the minute it appears that Bernie’s going out there [to run in the 2020 primary], we’re gonna go organize. I’m gonna be ready to campaign 9 to 10 months out of the year. I’m going to rehab now for this bad knee but as soon as I can—I’ll do a lot of walking. Though people often consider the intersection of race, gender and sexuality—class and age are often excluded. A popular narrative which pits people of different ages against each other is that of the spoiled, entitled and lazy millennial. Newport has sympathy, empathy and righteous outrage for the bleak economic reality that millennials face. It’s tricky. [Climate change] isn’t a leveler. In the short term what it does is exacerbate pre-existing inequalities. It’s already here for people who are very precarious and who have no protections. And it is true that wealth can buy you protection for a couple of generations. And in the meantime there are enormous profit potentials. It’s not very comforting that there’s such a keen interest in Mars. Because that really does start to feel like a Plan B. Not that it’s a realistic one. Ultimately this is a system that will collapse on everyone’s head… eventually. But in the short term there are definitely rooms that are going to collapse first. I’m not making the argument that it has to be the issue to trump all other issues. I think we need to have an analysis that is all about connecting the dots between all of these issues. 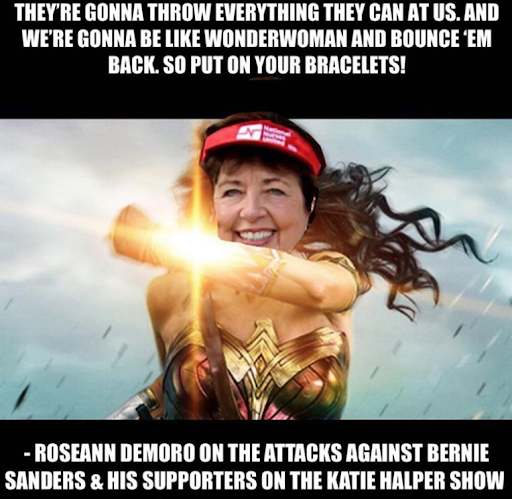 Former executive director of National Nurses United and of the California Nurses Association/National Nurses Organizing Committee, Roseann DeMoro does not mince words when describing the dishonesty of the latter group. I agreed that many of the people who spread the Bernie Bro smear are, indeed, disingenuous and malicious. Others, however, are more misinformed by the coordinated propaganda campaign which portrays Sanders as “bad on race and gender” whose supporters are a monolith of white men or people who want to curry their favor. Of course, as DeMoro and I agreed, one of the differences between Clinton and Thatcher is that neither Thatcher, nor her fans, ever claimed the Iron Lady was a feminist. I also interviewed Maria Svart, the national director of the Democratic Socialists of America (DSA), for The Real News Network and my podcast. She also criticized the Bernie Bro narrative. You can’t understand class without understanding gender, and race—and vice versa. How can you possibly understand, for example, the life experience of my grandmother, who was an undocumented Mexican immigrant, without understanding the much bigger picture, the whole systems of our society, whether it’s white supremacy or xenophobia or capitalism? They all intersect. And we need to talk about the complexity of that reality all the time, and we have to push back against lean-in feminism, mainstream feminism, all the time. Whether or not Sanders decides to run for the 2020 Democratic presidential nomination (and in case you can’t tell, I hope that he does), the movement he sparked is deepening its understanding and analyses of the intersectionality for the electoral and organizing work ahead in 2020 and beyond.